The original Ethno World release was reviewed in the May 2001 issue of SOS and, at that point, it consisted of a collection of 70 instruments supplied on five CDs. Things have since moved on, and Ethno World 4 Professional is now supplied on two DVDs, contains more than 200 instruments and over 9GB of samples. 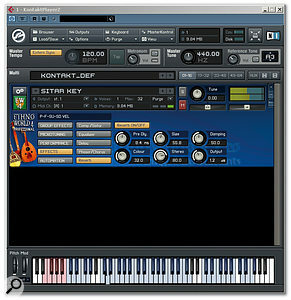 EW4P is supplied with the familiar NI Kontakt Player 2 as its front-end and, given earlier SOS reviews of products using Kontakt Player, there is little new to say about this part of the package aside from mentioning that it provides an effective, reliable and flexible user interface and that it supports stand-alone, VST, AU and RTAS formats. 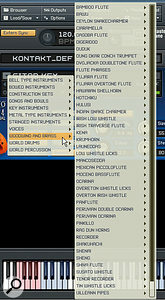 The instruments of EW4P are organised into 10 groups within Kontakt; bell-type instruments, bowed instruments, gongs and bowls, key-based instruments, metal instruments, string instruments, voices, woodwind and brass, world drums and, finally, world percussion. In almost all cases, there are both playable versions of the instruments (some with a small number of different performance articulations) and performance loops. There is a further group of 'construction kits' which contains various Kontakt 'multis'. These consist of performance loops mapped across the Kontakt keyboard and played on small groups of instruments from a similar region. Despite having played all of the 200 included instruments (honest! ), it would be impossible to describe every one in detail in a review of this length. What I'll try to do here is pick out the obvious highlights (or low-lights) and give you a general flavour of the library. As you can see, some of the EW4P instrument groups are particularly well populated. Within the bowed instrument category, a number of well‑known instruments (such as the Erhu) are present and correct, but the pick of the bunch are the Dilruba and the Esraj. These Indian instruments both sound great, with lots of character generated by the various resonance strings and an almost rustic sound — properties that come over particularly well in the performance loops. The Morin Khuur, which is rather like a violin and thought to have originated in Mongolia, is equally impressive. 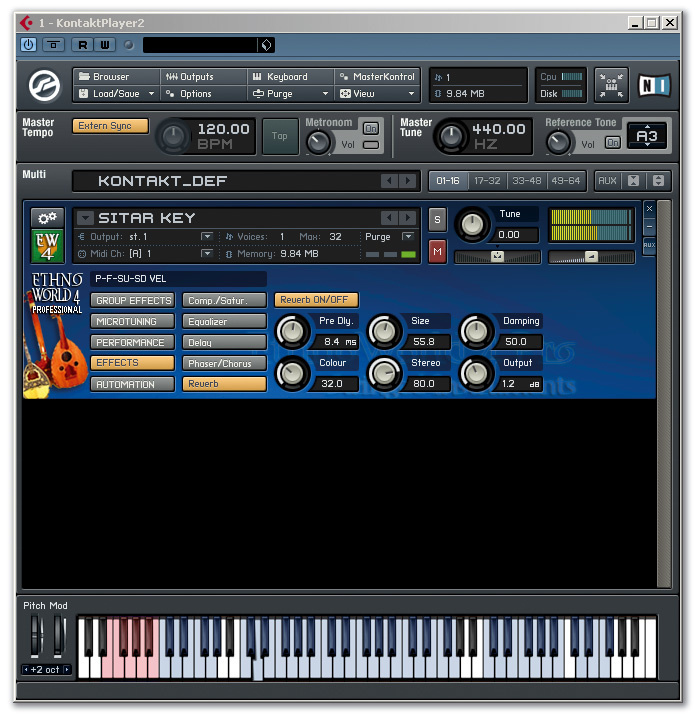 Two instruments of different sizes have been sampled and, in addition, some ensemble patches are included. The performance loops go from mournful — where the distinct character of the instrument comes through — to almost contemporary folk (where the sound is more like a conventional fiddle). The related Ih Khuur Bassa (a cross between a double bass and a cello) is also solid if some lower register is required. The plucked string instruments include such favourites as Oud, Sitar, Bouzouki and Banjo. As playable instruments, these all work quite well and, for example, the Sitar has a good range of articulations so that a convincing performance can be constructed. For some other instruments, this doesn't quite work as well, as is the case with the Resonator Guitar, which sounds great in the performance loops but is less easy to play in a convincing fashion via a MIDI keyboard. One or two of the more unusual instruments in this group are also worth a mention. I particularly liked the Grand Monochord — an instrument that looks like a table with strings stretched across it and is related to the piano family. As presented here, it is capable of producing some very dramatic sounds that seem like a cross between a harpsichord and a synthesizer. The Santoor (a Persian zither) is also great for evocative melody lines. A fairly modest set of keyboard instruments is included — a Hohner Melodica, a Harmonium and a Dallape Accordion — the last of which gives a nice flavour of Italy if played appropriately. The Voices group is rather an eclectic mix. Some useful, if fairly generic, male and female phrases and pads sit alongside a collection of rather weird and wonderful Mongolian voices. These include some ensemble groups and what is known as Khoomi overtone singing. I'm not sure how the sound is produced, but at times the effect is not unlike a didgeridoo! That said, EW4P is not going to challenge sample classics such as Vocal Planet from Spectrasonics. The woodwind and brass group features a much larger number of instruments covering a range of flutes, whistles, pipes and bagpipes. As with the bowed and plucked instruments, both playable instruments and loops are provided in most cases. The full character of some of the individual instruments is perhaps difficult to capture as a playable format without the need for lots of performance articulations, so the performance loops are a big plus here. Particular highlights in this regard are the Irish Low Whistle and Tin Whistle and the Hotchiku (a bigger version of the Shakuhachi), as all these include an abundance of performance loops. 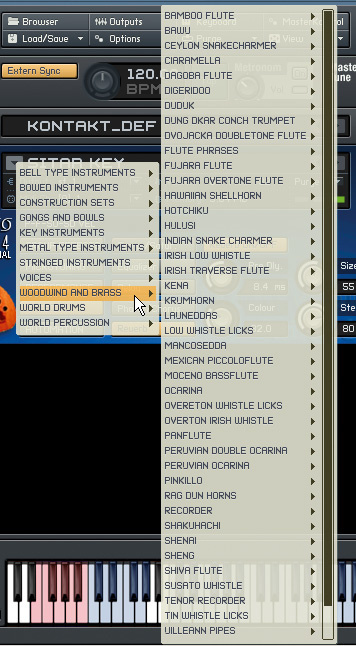 The Dudek and the various Ocarinas are also well sampled and offer good playable instruments as well as loops. Kontakt Player offers plenty of additional processing options for the EW4P instruments. In terms of things to hit, EW4P includes a wide variety of bells, metal-type instruments (including various cymbals), drums and percussion. Such instruments are, of course, somewhat easier to sample and, therefore, the majority of those represented here are very playable. Thankfully, however, for many of the drum and percussion instruments, performance loops are still included, so there is a range of genuine performances to get the novice World musician off to a solid start. These groups are packed full of very useable sounds. I particularly liked the Gran Military Cassa — a big drum with a big sound, but not as aggressive sounding as orchestral timpani — and the Waterdrums. If you do want something with a more aggressive edge, the Surdo might fit the bill, while the Hand Drums (with a nice set of loops) are also excellent. The percussion instruments feature various maracas, tambourines, windchimes, castanets and woodblocks, but perhaps the best of the bunch are the various shakers. These come in a wide variety, including eggs, rainmakers and nut shakers. There are also some very useful 'shaker sets', which feature performance loops from ensembles of shakers, with the occasional tambourine thrown in for good measure. Around The World In 9GB? Trying to capture the entire palette of traditional instruments from around the world in a single sample library is a daunting task even with modern sampling technology. However, EW4P does cover a lot of ground in its 9GB of samples. As playable virtual instruments, some of the patches work better than others, and where multiple articulations are provided (as in the case of the Erhu or Sitar, for example), it is easier to construct a realistic performance via a MIDI keyboard. This process is helped where performance loops are also included for a particular instrument and, fortunately, this applies to many of EW4P's instruments. While Ethno World 4 Professional might not provide a perfect or complete collection of traditional world instruments in a single box, it is still very impressive and full of sounds that will encourage the user's creativity. The asking price may put it beyond some but, given the number of instruments included, EW4P represents good value for money. I'm sure serious media composers would find plenty here to drop into the occasional film or TV cue, and musicians keen to add an ethnic flavour to their productions will find EW4P is well worth checking out. There is a large number of specialised 'world' sample libraries that cater for specific instrument groups or regions of the world, but relatively few that provide a broader, 'all-in-one' collection. Perhaps closest to EW4P in concept is EastWest/Quantum Leap's Ra library (reviewed in the October 2005 issue of SOS). Although this is now discontinued, remainder stock might still be found. Mac: OS 10.4 or higher, G5 1GHz or Intel Core 2 Duo 1.66GHz processor, 512MB RAM, 10GB free hard disk space, DVD drive. PC: Windows XP or Vista, Pentium or Athlon 1.4GHz processor, 512MB RAM, 10GB free hard disk space, DVD drive. Wide range of ethnic instruments in a convenient format. Good combination of playable instruments and performance loops. Some instrument groups are better populated than others. Further articulations would be useful for some of the instruments. Ethno World 4 Professional offers an interesting and varied collection of 'World' instruments in a single package. Well worth auditioning by those looking to add an ethnic flavour to their productions.